PCA9624PW 8ch I2C LED Controller Board is an I²C-bus controlled 8-bit LED driver board that uses the PCA 9624PW by NXP. NRND: This IC is not Recommended for New Designs. The individual PWM controller makes the brightness value of LEDs adjustable. This board itself already has LEDs on, so 8 LEDs will blink just by connecting the I2C bus and sending a command. LEDs are linearly aligned with an even spacing. For further information on how the controller works, please see manufacturer's official page, and PCA9624PW data sheet. 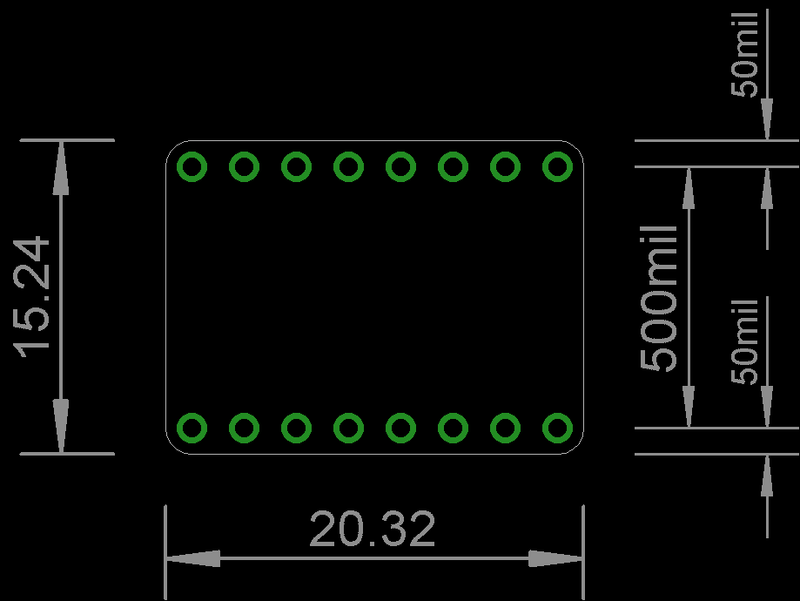 Supply voltage range: 3.3 V ~ 5.5 V.
Please prepare the pin header by yourself and solder it depending on your purpose. PCA9624PW has an Output enable pin (OE) and is on pull-up mode at default. Therefore, please keep on connecting OE pin to GND and validate port output to start blinking actions. The default address is 0 × C0 (1100 000X) due to solder jumper (A6 ~ A0). You will be able to change lower part of I2C address easily just by processing solder jumper (A2, A1, A0). When changing address on upper part, you will need to process solder jumper (A4, A3) on surface and (A6, A5) on back. First, cut the pattern on jumper and then, connect it to VDD (1) or GND (0) with a cable. 3) Don't change anything on the other one and connect it to the same I2C address. 4)Access both to 0 × C0 and 0 × C2 from host and coordinate the movements. Below is what you will actually see after this procedure. The 16 LEDs are linearly aligned looking like one module. 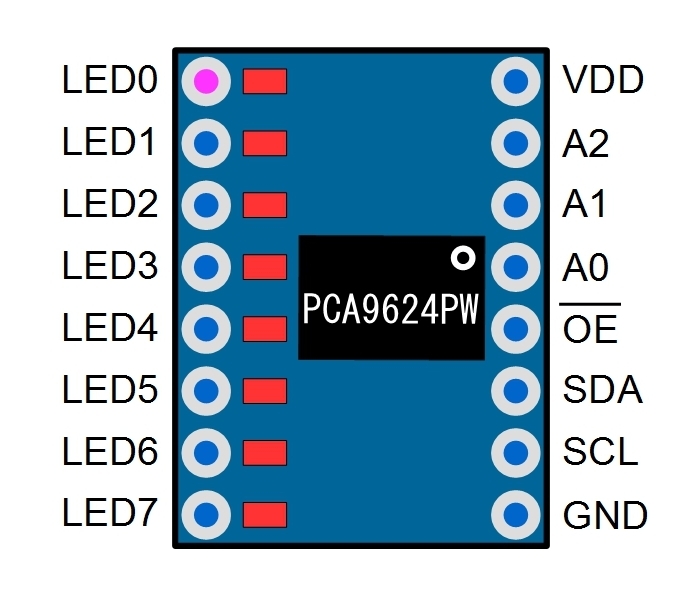 You will be able to make an even longer LED board by adding another address converted module. PCA9622DR is not connected to this demo, however if the address doesn't overlap, it can coexist.